The former church of St. Jost Church in Cesky Krumlov is a two floor building covered by a steep saddle roof and five floor tower. In spite of all reconstructions, some parts of the former Gothic church were preserved. The building remains with the Gothic constructions and details. There is still recognisable the north Gothic front side, the original round ridge vaults on the ground floor, and the original vaults of the church remain on the second original floor. We can also see the original pedestal of the pillars in the cellars. Formerly on this place was a chapel of St. Jost established in the 14th century by Peter von Rosenberg. The chapel was a part of the Rosenberg�s hospital. At the end of the 16th century the church was reconstructed in Renaissance style by Peter Wok von Rosenberg according to an architect Domenico Benedetto Cometta of Eckthurn. This reconstruction remarkably changes the church. 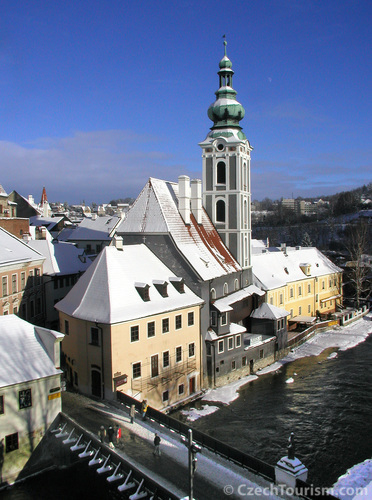 In 1598 the church, newly consecrated to The Holy Trinity, was given to the Protestants in Cesky Krumlov. 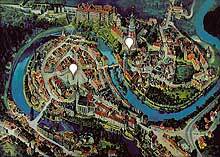 Because of many Germans coming to settle in Cesky Krumlov, the sermons were given in German. The church was also used by the members of the Unitas Fratrum, whose supporter was Peter Wok von Rosenberg. In the year 1600 was strictly prohibited to use the church for non-Catholic purpose by the emperor Rudolf II. von Habsburg. At the beginning of the 17th century the church was passed to the Jesuits. It was again consecrated to St. Jost and St. Anna as a "German church". The church was closed down at the time of the reforms of the Josef II. at the end of the 17th century and its furnishing was given to the other churches in the region of Cesky Krumlov. At the end of the 18th century the municipal council of Cesky Krumlov sold the building and the tower was passed over to town ownership. The building was reconstructed - there were cellars newly built, the level of the ground floor was lifted, the presbytery was destroyed with a linking block of entrance aisle. In 1802 the building was rebuilt into a casino with a bar and a dancing hall. At that time a terrace on the side leading to the Vltava river was built. In the first half of the 20th century the former church was used as a residential accommodation, Bata shoe shop or a store for bike and motorcycle shop. Today is the former church of St. Jost used as a Marionette Museum, shops and restaurants. You will find the church under the Cesky Krumlov State Castle near the river Vltava in a street Latran 6.